Birla Precision Technologies Ltd is an India-based company. The company is engaged in the business of manufacturing of a wide range of precision AT3 Class tool holders, HSK tooling, Expanding Mandrels and Sleeves besides advanced products like hydro grip and shrink fit CMC tooling. The company is having their manufacturing facility located at Aurangabad. 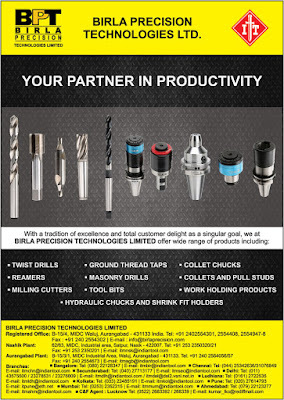 Birla Precision Technologies Ltd was incorporated on October 13, 1986 with the name Birla Erickson (Tools) Ltd. In December 1989, the name of the company was changed to Birla Kennametal Ltd. The company was established as the joint venture between Birla International Pvt Ltd, a Yash Birla Group and Kennametal Inc, USA. The company set up a manufacturing unit for producing Machine Tool Accessories at Aurangabad with a production capacity of 50,000 Nos and in January 1989, the unit commenced commercial production. During the year 1998-99, the company increased the production capacity of Machine Tool Accessories by 50,000 Nos to 100,000 Nos. During the year 1999-2000, the company was appointed as Distributors for marketing entire range of Kennametal toolings in India. During the year 2000-01, the company developed new generation HSK tooling, which has good potential market in Europe. During the year 2001-02, they were successfully re-certified for their quality standard and were awarded ISO 9001:02 Certification. During the year 2006-07, the company converted their existing Tool Holder and Work Holding manufacturing section into an 100% Export Oriented Unit with effect from June 1, 2006. Shearson Investment & Trading Company Pvt Ltd, a Yash Birla group company purchased 1,420,000 equity shares of the company from Kennametal Inc, USA whereby the shareholding of the Yash Birla group in the company increased to 88.48%. As a consequence to this, the joint venture agreement between Kennametal Inc and Birla International Pvt Ltd, a company of Yash Birla Group came to an end. Also, the company entered into an agreement with Kennametal Inc, USA for supply of their products to Kennametal Inc and their subsidiaries worldwide, for a period of 5 years starting July 4, 2007, in order to ensure continuity of the existing export business. During the year 2007-08, the company expanded their production capacity of Rotating Tool Holder from 10,000 Nos per month to 18,000 Nos per month and Collets from 1,000 Nos per month to 15,000 Nos per month to meet the increasing demand of domestic market as well as of overseas market. In November 20, 2007, the name of the company changed from 'Birla Kennametal Ltd' to Brla 'Precision Technologies Ltd'. During the year 2008-09, the company diversified into the new business of manufacturing / machining of auto and precision components at Aurangabad. Also, Indian Tool Manufacturers, a division of Zenith Birla (India) Ltd merged with the company with effect from April 1, 2008. The company plans to expand their capacity by making an investment of approximately Rs 4 crore for adding machinery for manufacturing their product namely, 'Collet'. Leveraging its core competency of machining, forward integration into machining of precision components and castings was a natural progression and catering to global giants like Cummins, Knorr-Bremse, Husco International .